We celebrated CSA Day 2018 on Good Day Kentucky with an interview by Dough High. 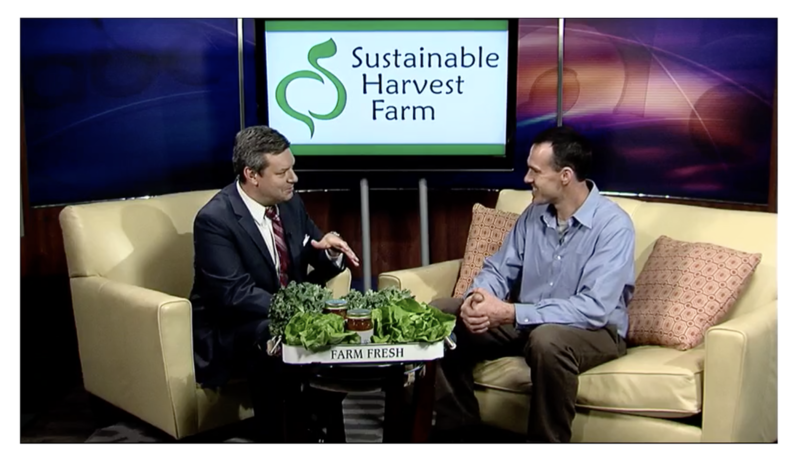 Click here to see the news clip and learn more about our CSA. ​On this day, we are joining with CSA farmers from across the country to celebrate CSA Day. According to Small Farm Central, this is the most popular day of the year to sign up for a CSA share and now is when we need your support. This is an important time of year for us to get new members signed up because we are in the process of making the investments that will result in a successful harvest many months from now. Our CSA would not be possible without your support. We are thankful for you and we love being your farmer. This is an exciting opportunity for an independent, driven individual who is passionate about organic produce, sustainable living, and supporting a local farm. Founded in 2009, Sustainable Harvest Farm delivers farm-fresh, certified organic produce directly to customers in Tennessee and Kentucky through customizable community supported agriculture (CSA) shares. We are looking for a motivated, energetic, and dedicated individual to connect communities, workplaces, employees and consumers to our products by building relationships in Lexington KY and surrounding areas. Do you believe in the value of buying organic produce from a local farmer? Are you an advocate of the “farm-to-fork” movement? Do you enjoy working with people and building relationships? Do you have a positive attitude and a drive to be successful? If so, we can provide you with a unique position to meet new people, effect positive change for the wellness of both people and the environment with a flexible, part-time career opportunity. Identify, prioritize, and coordinate meetings with local business contacts, such as corporate HR managers, wellness program managers, office managers or business owners. Research and identify businesses who support “healthy living” and advocate the health benefits of offering CSAs for employees at worksites. Educate the business contacts and consumers on the products and services that Sustainable Harvest Farm CSA offers and the benefits associated with eating local, organic produce. Engage with potential customers and enthusiastically represent Sustainable Harvest Farm at events in the region. Secure CSA sales through community engagement and establishing CSA pickup locations.